Whether in a warehouse, a delivery center, shipping and receiving or even trucking applications, pallet jacks are an indispensable tool. 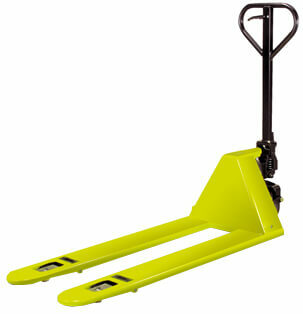 Using one to move heavy or bulky loads is not difficult and it will keep you from injuring yourself. There are many terms for this tool such as pallet jack, pallet truck, pump truck, or even forklift trucks. Whatever the name, they basically perform the same function, move heavy loads safely. Front wheels are mounted inside the forks and as the hydraulic jack is raised, the forks separate from the front wheels. As this happens, it forces the load upward until it clears the floor. 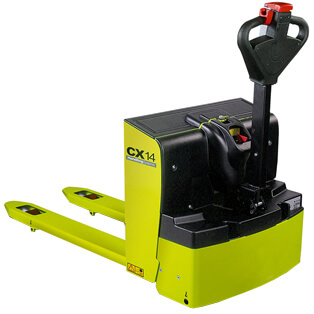 It is only lifted enough to the clear the floor unless dealing with a high lift pallet truck. 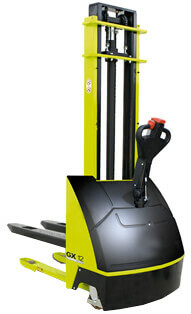 High lift trucks allow the user to not only move objects but also lift them up high. We carry manual and electric variations of this style pallet jack. Also below, look for a complete line up of electric forklift trucks and stackers for more versatility around your facility. Forklift trucks come in various sizes for a full range of container sizes and weights. Weight capacities are from 2200 lbs to 5500 lbs. Lift heavy tool boxes, skid mounted pressure washers, or chemicals without risking injury to you or others. Learn general safety rules for pallet jack use and ensure taking a look around the area where you are moving the load. Be sure to check the load weight and limits of your forklift truck. Avoid strains and injuries and work quickly to move heavy items in your worksite. 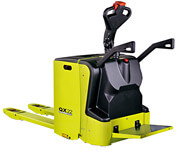 The GS Special series, available in several versions, is the ideal working tool for moving nearly all sizes of pallet. Suitable for smooth floors or other kinds of surfaces, these pallet trucks guarantee easy and light maneuverability. Easy finger tip control, rugged chrome pistons. Reinforced frame for heavy loads. 210 degree turning radius. Leak proof pump with overload protection. Fork Lengths: 32” - 48"
The HX 10M series allows easier and lighter manual lifting up to a height of 32”, creating a useful workbench suitable for places like mechanical workshops. It can also be used to support other machines in production, picking and similar areas. The CX14 powered truck is available in several versions fitted with MOSFET technology. They are suitable for carrying loads on smooth floors and other surfaces. The small size and turning radius make the CX14 range ideal for work in areas where space is at a premium, such as lorries or narrow aisles. The QX22 is the ideal machine where high speed movement of goods over long distances is required. Its high load capacity (2.2T), its excellent translation speed (6mph), its high battery capacity (315Ah) and mobile battery change station makes the QX22 the best choice for multi-shift operations. This compact truck provides the perfect solution where space is at a premium. Thanks to the recent product development, these stackers are now even stronger more, reliable and closer to customers’ needs than ever. The use of special highly resistance steel, and the stronger protective covers are just some samples of their modifications. To ensure the pallet jack operates properly, lubricate it with a grease gun at the grease fitting below the handle. Lubricate the axles with WD-40. Before you start moving the pallet, make sure the load is evenly distributed. If the load is uneven, it can fall while you're moving it, potentially damaging whatever was on the pallet. You'll need two people for heavy loads. One person should push, while the other pulls. Trying to move a heavy load alone poses an injury risk. Make sure the forklift truck is lowered fully before moving the jack out. If the jack is not all the way down, a sudden jerk could tip the load on the pallet.